Week 15 last weekend in Serie B saw the results split between home wins and draws. No away side went home with anything more than one point. We start off in the Lazio region as Frosinone hosted Tuscan side Livorno. There was no hint of the result to come when Livorno took the lead after 16 minutes. A fine individual goal from Luca Siligardi put the visitors ahead after 16 minutes. The lead was shortlived, however, as Il Canarini equalised a minute later through a Leonardo Blanchard shot at the far post. Striker Federico Dionisi put Frosinone ahead on 38 minutes, slotting the ball home from 10 yards out. Lambrughi was sent off for Livorno for two yellow cards early in the second half to made the visitors task even harder. Daniele Ciofani made it 3-1 from the penalty spot on 62 minutes after Soddimo was brought down in the area. The game was as good as won then for Canarini but two late goals, from Paganini and Curiale made the final score 5-1 to the home side. Frosinone stay second with this win, and Livorno are fourth. Bari earned a vital win against Trapani, winning 2-1 at Stadio San Nicola. The home side opened the scoring after 32 minutes through Cristian Galano. The striker finished well after breaking past his man to slot the ball past the keeper. Francesco Caputo put Bari two up on the hour mark as he scored from the penalty spot. Matteo Manscosu reduced the arrears with ten minutes left,as he converted from the penalty spot to set up a tense finale, but i Biancorossi held on for the win. Bari move upto 12th, Trapani are 9th. Two goals either side of half time for Pro Vercelli was enough to earn them a win by two goals to nil against Virtus Entella. Scavone put the home side ahead on 12 minutes, and Fabiano sealed the win with a goal on 65 minutes. Vercelli move up to 10th, Virtus Entella drop to 19th. 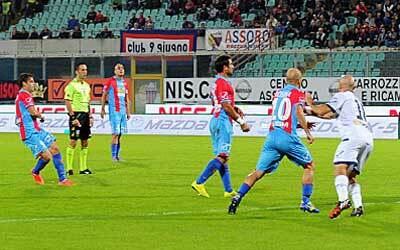 Catania's revival under Guiseppe Sannino continued with a 1-0 win over Latina. The only goal came after 10 minutes through Italian striker Emanuele Calaio. This was Catania's third win in five games and it moves them upto 11th. Latina drop to the bottom of the league after this defeat. In the only other match to result in a win, Modena defeated Pescara 2-0. A late double from Pablo Granoche sealed the points and the win moves Modena upto 13th. Pescara are 17th. All the other games ended in draws. Avellino and Varese was goalless. Brescia drew 3-3 with table toppers Carpi. Perugia drew 2-2 with Ternana. Three games finished 1-1, they were Spezia-Bologna, Virtus Lanciano-Crotone and Vicenza-Cittadella.